While working as a gift wrapper during high school, I was taught to dress up a present with serious discipline (there was a training period!). Creasing every corner of the paper, folding and taping so that the ends of the paper lined up exactly with the edges of the box—they might as well have been snapping at the wrapping team with whistles. The ribbons we used were all silk, which made for peppy round bows like curlers. Ribbon from Food52 on Vimeo. But when it came to bows, we went wild—wild, I tell you—by doubling the colors and looping loops so huge we went through multiple spools in a day. What did I learn, besides that there are easier ways to earn a buck and that silk ribbon is expensive? Silk ribbon wants to be springy, and there is a best way to tie it. Which got me thinking: What about other, more affordable ribbons? Ribbon 1 is tied around the box and knotted; ribbon 2 (the bow!) is pinched together in one hand, soon to be secured on the box. Tie a piece of ribbon about your box and knot it where you want the bow. Fold a second length of ribbon back and forth (those will be the loops), pinching it between your fingers in the middle (that will be the knot). Wired ribbon is forgiving; it has invisible, bendy wire woven into the edges, so it's easy to shape (i.e., make prettier) once your bow is complete. And this wired nylon has an airiness to it, begging to be fluffed and puffed and pinched. Knotting it actually added volume to the final bow, and the tied part can be covered up by shaping the loops. Left (before): a 4-loop wired nylon ribbon; right (after): a much flufflier 6-looper. My first go at this bow was admittedly sloppy (above, left)—I meant to make 6 loops but had actually only done 4, and as you can see it's a little raggedy. To tighten things up, I used the standard pinching method detailed above but added in those lost loops, and also made them smaller (smaller loops = perkier) so it would be fuller (above, right). As always with wired ribbon, futzing with the finished bow is a good idea. Left (before): crushed satin ribbon; right (after): perky satin bow. Satin ribbon is thick, shiny, and smooth (with many of the merits of silk without the price tag), but it doesn't take well to knotting, which makes it pinched, sloppy, and flat rather than fluffy—with too much focus on the knot instead of the bow. To lessen the tension around the knot, I made small slits on both sides of the bow right where it gets tied to the package, and also chose to make the loops a little smaller. When I secured this bow to the box (above, right), the loops were much more spritely and there were no signs of crushed ribbon (the original bow is above, left). Using sharp scissors, cut a little slit on both sides of the folded satin ribbon before securing the bow to the box. Grosgrain is one of my favorite ribbons, but I think it's undervalued as a bow-tying ribbon (more frequently used for decorative purposes in clothing-making) because it's so stubborn. Unlike wired ribbon and satin ribon, grosgrain is hardly smooth and springy; it's ribbed, matte, and a little bit like paper. Left (before): a knot-heavy grosgrain bow; right (after): a simple shoelace bow tied from the ends ot the original ribbon. As you can see, the pinch and tie method (above, left) did not result in an appealing bow—the knot was so massive and gnarled that it was taking all the attention (the horror). It was clear to me that one less knot was in order. Use the ends of your wrapping ribbon to tie a one-know shoelace bow (rabbit-ears style). Instead of making a separate bow out of grosgrain and attaching it to a tied ribbon, be sure the original ribbon is extra-long on both ends and then use those ends to tie a simple shoelace bow, making two loops and then knotting them together. Here are the finished bows! This article originally ran this holiday season, but we can never get enough bow lessons this time of year so we brought it back. It's wrapping season—hooray! (Just me?) What's your go-to ribbon? My bows have expanded to include.....One of the most recent options: a variety of colors of tulle on rolls. Different widths offer options for combining unique color combos or different widths to make bows "pop". I am having so much fun with this new choice of "ribbon"
Well...at age 10, I discovered the inherited gift of "artiste" and immediately informed my mother that I would happily take on "the annoying task" (her description) of wrapping Christmas gifts to place under the tree. I took note of a department store employee making a bow using the snipping-at-the-middle technique. I marveled as she unfurled the strands of ribbon into a beautiful decoration. I took the idea and ran with it...creating my own "masterpieces" by adding more folds and longer folds of ribbon to suit the size of the package. My mother was in awe of the pleasure that was abundantly apparent as I enjoyed "the task." The same held true with my affinity for cooking (at age 10.) Once again, "a chore" in her lexicon. God rest her soul, as I continue to wonder how I inherited these genes. As a second generation Lithuanian, my foremothers were, most likely, cooks by the sheer nature of workers and lovers of the land. A creative lot, by necessity...as am I.
B&J Florist or M&J Trimming, in New York! I'm pretty in love with the cutting a slit for the satin bow. I'm super gonna use this technique on my satins now! Do you have any tips for burlap ribbons? I want to use them in my garland and presents this year, but having a problem make a pretty bow. Thanks for any tips you may have. I would definitely use burlap ribbon that's wired, and make the loops about twice as big as the ribbon is wide. 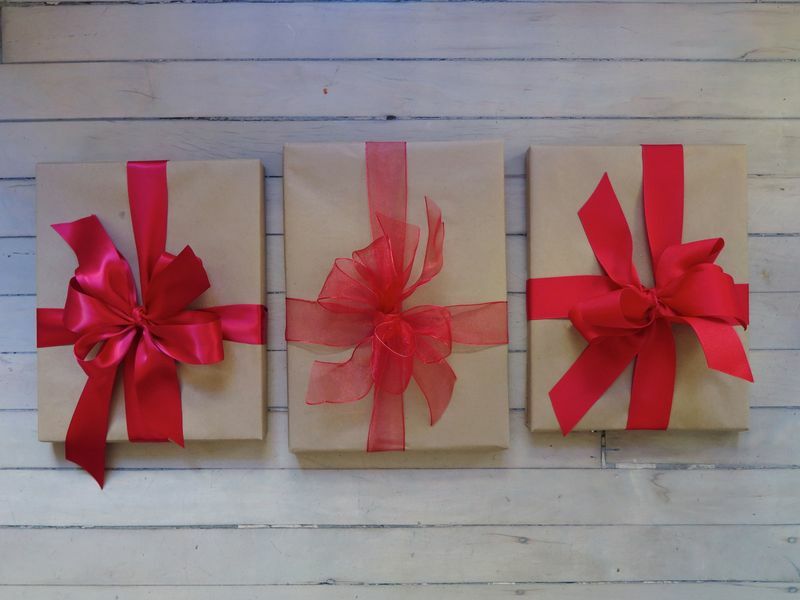 For gifts, something smaller (like twine, or linen ribbon in a shoelace bow) might be nice! This all-encompassing article on bow-making is just one more reason I love FOOD 52. Instructions+pics=success. Great job, Amanda! Love your descriptions of how to handle the different types of ribbon. I used to think it was all my fault but now realize it depends on the ribbon fabric and how to handle it to create a very pretty holiday gift presentation. Simply draw a bow onto the paper with coloured pencils or paint! An unexpected arty touch.